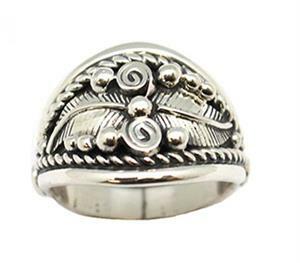 This sterling silver mens ring (aka: saddle ring), has two leaves with silver drops and curly Q's. It measures approximately 3/4" wide in the center and tapers down. Crafted by a Navajo artisan. Now available in size 9, 11, 12, 12 1/2 or 13. *** Choose sizes when ordering.